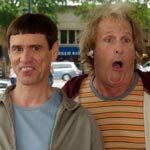 Dumb and Dumber To lives up to its name and really, there’s nothing more to it than two characters bumbling around the country one upping the jokes with each scene. No, it’s not that good and it’s of course nowhere near as funny or memorable as the original but for what it is, I can’t say I regretted seeing it, though I doubt I’ll remember much in a month. This “Special Edition” of “The Walking Dead” re-release is pretty odd as we rarely see a double dip for a television series, not to mention one on Blu-ray high-definition. As it is, the release itself is pretty good from the show itself being a great zombie horror/thriller to the features including an expansive documentary and commentaries on all six episodes.